30 x 30"; 380 hp; 80 rpm engine, G.N. Oills, St. Catharines. 1872 Launched St. Catharine, ONT. 1872, Aug 16 Ashore Grenadier Island 20 miles below Kingston, ONT; 6' water in hold. 1873 Owned Graham & Campbell; ran in Merchant's Line, Chicago-Montreal thru 1880. 1877, Sep 3 Hole in port from striking pier coming into Pt. Burwell; lies in 8' water about 80 rods from harbor; raised Sep 8. 1877 135 x 23.2 x 11.5; 626 gross tons/397 net tons. 1882 J.C. Graham, St. Catharine, ONT; Montreal to Port Arthur. 1883-84 Wintered Soo; owned Rorie McLennan, Prince Arthur's Landing. 1884, May 4 Sunk north shore Lake Superior, Michipicoten Bay; laden with supplies for Canadian Pacific Railway. 1886 Rebuilt Kingston by John Gaskin; 170 x 26 x 11; 732 gross tons/438 net tons; renamed GLENGARRY. 1888 Received steeple engine by G.N. Oills 21 + 36 x 30"; 380 hp; 80 rpm; fire boiler 10 x 14 108#, 1888. 1890 Montreal Transportation Co; repaired 466 tons. 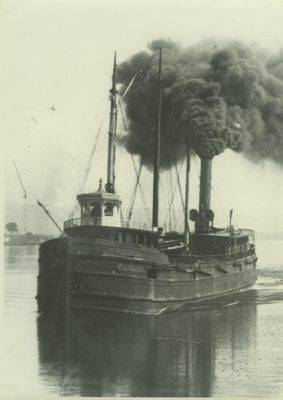 1890s Towed 4-mast barge MINNEDOSA. 1892, Jun Caught fire at Kingston, ONT; after cabin destroyed, one lost. 1898, Apr 29 Collision with CLINTON, Maumee Bay, Toledo. 1911 R. Richardson Forwarding Co.
1912 Sorel, QUE; reduced to barge.